As Ibsen continues to reject God, Strindberg wavers between 'Affirmation and Negation', finally giving way to a 'Melancholy Fatalism' which one never finds in Ibsen. Ibsen's revolt is total. He is dissatisfied with the 'Whole Creation', and not just certain contemporary aspects of it. His deepest quarrel is probably less with those pillars of church, state, and community who dominate his plays, than with the supreme authority figure, God himself. Behind his demand for a new beginning for 'Mankind', one can glimpse his half-hidden desire to 'fashion a new creation', more in keeping with the logic of his poetic imagination. With this 'New Creation' represented by the body of his art, the basic Ibsenist conflict is frequently messianic-its Hero a Rebel against God, and its issue not superficial changes in the social structure, but a complete alteration in the moral nature of man. On the other hand, identification with Lucifer and rebelling against a mad, merciless, mechanical will are important aspects of the first phase of Strindberg's career. In his opposition to established authority, Strindberg's also identifies with related figures like Cain, Prometheus, Ishmael--all 'Rebels of God'. Strindberg's admiration for Religious Rebels pass him well beyond the usual revolutionary postures to an embrace of Satanism, under the spell of which he practices, black arts/magic, worships the occult, and studies the transmigration of souls. As the Confessor says in The Road to Damascus: "This man is a demon who must be kept confined. He belongs to the dangerous race of rebels; he'd misuse his gifts, if he could, to do evil". Strindberg's flair for self-dramatization leads him to exaggerate his demonic activities, for they were really harmful to nobody but himself. However, there is no doubt that he thought himself pledged Lucifer by way of a Mephistophelian pact. This seems like a much more radical form of rebellion than anything found in Ibsen. But as Strindberg implies in Inferno, "Ever since childhood, I have looked for God and found the Devil". His revolt against authority is reality the reverse of his desire for authority posture, Strindberg's revolt is always a little nervous and uncertain, rather like the act of a man in constant dread of retribution. And while Ibsen's messianism remains constant, Strindberg is gradually tempered by his fears of divine revenge from an omnipotent power. Even when he considers himself a 'Free-thinking Atheist, these fears are never far from the surface. He became an unbeliever, as he declares in Inferno, when "the unknown powers let slip their hold on the world, and gave no more sign of life. But when these "unknown powers" do begin to appear to him in the "nineties", his messianism becomes less and less defiant, until he finally becomes convinced that the powers are personally guiding his destiny, and revealing themselves to him in every material object. Strindberg has been suffering from a religious state called "Devestatio". God has been seeking him, and he has been too proud to let himself be found. Freed from his torment after his insight, he determines to live a life of 'Repentance'. He, therefore, gives up his occult and scientific studies, begins to wear a habit of monkish penitential cut, and even contemplates entering a monastery after the publication of 'Inferno'. Theologians might say that he has finally found his way to God after a long period of resisting him. No longer defying the Universe, or trying to become God, Strindberg is now yielding to the unknown and seeking to do its will, looking for correspondences rather than causes. He has replaced his former Naturalism and Atheism with a new concern for the supernal forces behind material things. The frequent subject of his satire now, in fact, is his old impious self, the rationalistic, blasphemous male with aspirations towards the superhuman. For, in this second phase of his career, many of Strindberg's plays are designed as 'Acts of Penance', in which he tries to expiate his sense of guilt, and scourge his desire for worldly vanities. While the tones of his plays are more saintly and forgiving, Strindberg's thematic concerns have also remained essentially the same. Even his new religious humility is modified by traces of the old skeptical arrogance. If Strindberg is no longer fighting God, he is still questioning him, for he is still a rebel, raging against the lawful limitations of his humanity. He has tried to escape from life into a realm of pure spirit, but he cannot resist the pulls of the body which drags him back into the filth, muck, and flesh of the material world. With his work in our hands, it is perfectly clear that this rebel's eternal struggle with God is the key to his greatness. 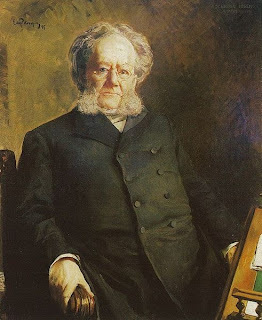 Ibsen continues to believe in the importance of the will, and begins to measure his rebellious ideals against the social reality. He seeks a spiritual and moral revolution which will transform the soul of man. Strindberg, on the other hand, comes to believe in a strict determinism (The Higher Power), and loses faith in his rebellious ideals. He seeks deeper spiritual insights in order to resolve his own painful dilemmas.